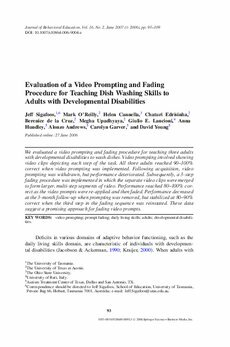 We evaluated a video prompting and fading procedure for teaching three adults with developmental disabilities to wash dishes. Video prompting involved showing video clips depicting each step of the task. All three adults reached 90-100% correct when video prompting was implemented. Following acquisition, video prompting was withdrawn, but performance deteriorated. Subsequently, a 3-step fading procedure was implemented in which the separate video clips were merged to form larger, multi-step segments of video. Performance reached 80-100% correct as the video prompts were re-applied and then faded. Performance decreased at the 3-month follow-up when prompting was removed, but stabilized at 80-90% correct when the third step in the fading sequence was reinstated. These data suggest a promising approach for fading video prompts.